Buckeye Valley’s Andy Nero (6) looks for some room to run during the first quarter of Tuesday’s showdown against visiting Wellington. 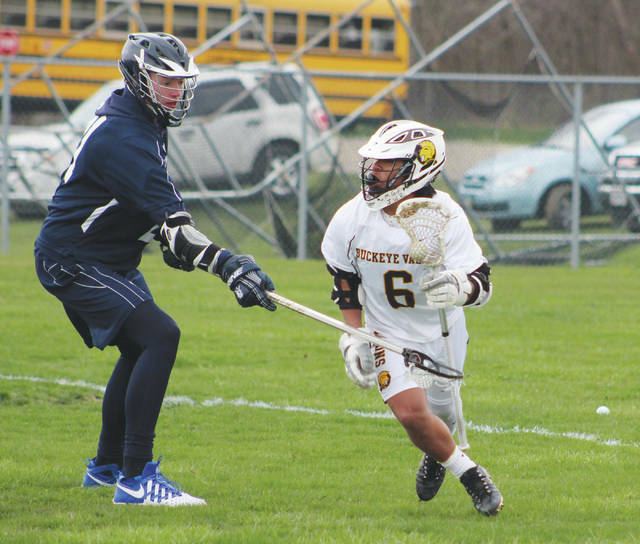 The Buckeye Valley boys lacrosse team started strong and never looked back, rolling to a 17-1 win over visiting Wellington Tuesday in Delaware. The Barons jumped out to a 7-0 start after a dominant first quarter and won the second by a 6-1 margin to take a commanding 13-1 lead into the break. BV outscored Wellington 4-0 in the second half to seal the deal. Nathan Heiser led Buckeye Valley with four goals and a pair of assists while Trent Slavik added three goals and an assist of his own. Hesier and Slavik are two of 10 seniors on the team — a crew coach Billy Heiser credits for the team’s fast start. Andy Nero, a junior, was also steady, finishing with two goals and two assists while sophomore Reid Lajeunesse had two goals and three helpers. The Patriots got it done with defense, parlaying a 3-1 halftime lead into a solid OCC win over the Pioneers Tuesday in Powell. Liberty scored all three of its first-half goals in the opening quarter. Kyle Dolan broke the scoring seal off a feed from Spencer Towne and, after Orange tied it up with a tally from Luke Schmeling, Andrew Guagenti made it 2-1, scoring a coast-to-coast goal courtesy of the hidden-ball trick. A defensive stop and transition goal by John Paolo made it 3-1 after one. The teams battled through a scoreless second quarter before Johnny Wiseman scored early in the third to make it 4-1. Orange battled back, getting as close as 5-3 when Schmeling found Sam Hughes for a goal with 4:01 left in the third, but a 3-0 run capped by a Tyson Chapman goal gave Liberty an 8-3 lead with 3:18 to go. The Pioneers got one back less than a minute later as Schmeling scored his second of the night, but Matthew Barrett found the back of the net with 1:40 to go to smooth out the scoring summary. Riley Bruening scored four goals, including what turned out to be the game-winner late in the fourth, to lead the Braves to a hard-fought win over the visiting Eagles Tuesday in Lewis Center. With the game tied at five after three quarters of action, Blake Profio gave Olentangy a 6-5 lead off a feed from Khairi Sears early in the fourth quarter. New Albany scored with 4:35 to go, cutting its deficit to one, but the Braves’ defense stood tall down the stretch. Also: Worthington Kilbourne 13, Delaware Hayes 1. New Albany 17, Olentangy 7; Big Walnut 17, Westerville South 6; Worthington Kilbourne 18, Delaware Hayes 7; Olentangy Liberty 19, Olentangy Orange 3. Olentangy set the tone with a convincing first-set win before taking the next two to knock off visiting Olentangy Liberty Tuesday in Lewis Center. The Braves won the first set 25-10 before securing the second and third by respective margins of 25-21 and 25-15. Kurt Freeman led the way with 13 kills while Aaric Gossett and Jamir Benton added eight apiece. Benton also added six blocks to his stat line while Zane Nelson finished with seven aces, Bentley Azbell chipped in 20 digs and Trent Trees had 29 assists. The Big Walnut boys lacrosse team cruised past visiting Johnstown-Monroe Monday in Sunbury, blanking the Johnnies 10-0. BW scored three goals in each of the first two quarters before smoothing out the scoring summary with four in the fourth. Johnny Grumney led the Golden Eagles with four goals while Nathan Montgomery added three goals and an assist. Other standouts included Sam Elliott, who finished with a goal and two assists; Luke Chiles, who had a pair of helpers; and Tyler Paul, who collected nine ground balls in the win.